Fox NewsGavin McInnes, founder of the far-right ‘Proud Boys’ group, brandishes a sword after giving a speech in New York City Friday night. Video purportedly shows members of the far-right group the “Proud Boys” beating up anti-fascist protesters after their leader gave a talk in New York City on Friday. In a separate incident, three protesters were arrested for assaulting a New Jersey as he was leaving the Gavin McInnes speech. NYPD officials said they are reviewing footage from the event to see if more arrests are necessary. Newly released video reportedly shows the moment members of the far-right group the “Proud Boys” attacked anti-fascist protesters. Dozens of protesters gathered outside the Metropolitan Republican Club on New York City’s Upper East Side Friday night, where Proud Boys founder Gavin McInnes was scheduled to give a speech. As the event was letting out, some of the attendees allegedly assaulted some of the so-called “Antifa” protesters. 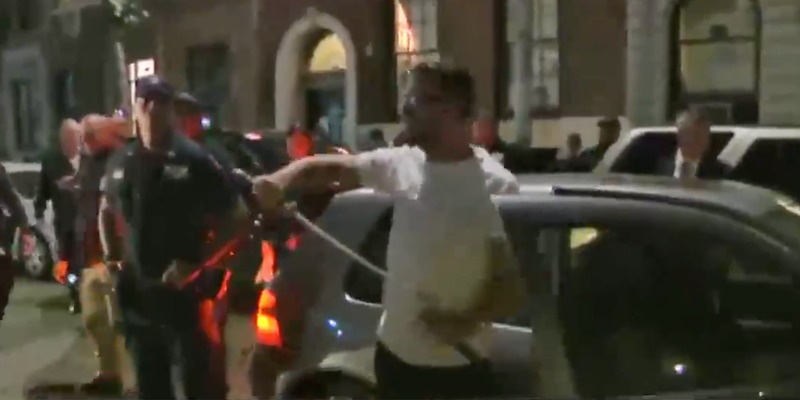 But the only arrests that were made that night were in connection to another incident, involving three protesters who allegedly assaulted a New Jersey man as he left the talk. The NYPD said it is reviewing video footage of the event and speaking to witnesses to see if more arrests are necessary, and asked anyone with information on the incident on the Upper West Side to call 1-800-577-TIPS. “If you were a victim of an attack, we urge you to file a complaint so we can bring those perpetrators to justice,” the NYPD tweeted on Saturday. Photojournalist Shay Horse, who was there, told Buzzfeed News Proud Boys members ganged up on Antifa demonstrators. “There was a big group of like 30 of them, and they came out grunting … trying to hype each other up,” Horse said. 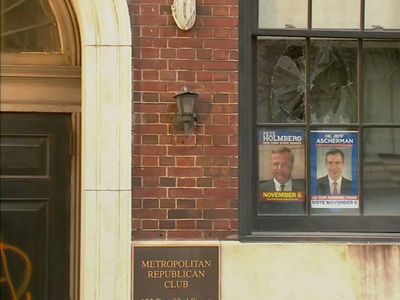 WABCPrior to the event on Friday, protesters threw a brick through the window of the club and spray-painted the doors with the anarchy symbol. Horse said cops escorted the group only to the corner of the block and that the assault happened about two blocks away from the event. He said he talked to some of the Proud Boys members involved and they said that the fight broke out when one of the Antifa protesters tried to swat a “Make America Great Again” hat off one of their heads. “One dude started screaming, ‘Do you feel brave now f—-r,'” he added. Eventually, an NYPD officer rolled up to the scene on a scooter, Horse said, and broke the fight up. But he said the Proud Boys were allowed to leave without being questioned and no arrests were made. Another journalist, Sandi Bachom, took video of an assault that appears to be the same one Horse described. New York Gov. Andrew Cuomo called on the NYPD to arrest the perpetrators. New York City Mayor Bill de Blasio said the NYPD is “fully investigating” the incident. Before the event, protesters vandalised the Republican club, throwing a brick through a window, spray-painting the anarchy symbol on the doors, and gluing the locks. No arrests have been made in connection to the vandalism yet.